Charlotte's police chief said Thursday he planned to show video of an officer shooting a black man to the slain man's family, but the video won't be immediately released to the public. NBC News confirmed Thursday evening that the family of Keith Lamont Scott had seen the shooting dashcam footage. An attorney for the family also said that they want the footage to be released publicly. Charlotte-Mecklenburg Police Chief Kerr Putney told reporters during a news conference that the video does not definitively show 43-year-old Keith Lamont Scott pointing a gun at anyone. "Right now my priority is the people who really are the victims of the shooting," Putney said. "I'm telling you right now if you think I say we should display a victim's worst day for consumption, that is not the transparency I'm speaking of." In response to a reporter's question about the decision to hold back the video from the public, Putney said he promised transparency, "not full transparency." "Transparency is in the eye of the beholder," he said. Scott's family watched body camera and dashcam video footage of the shooting Thursday afternoon, and they said through their attorney that they want it to be released to the public. Attorney Justin Bamberg said that, in the video, Keith Lamont Scott is seen calmly exiting his vehicle and while police gave him several commands, he did not approach officers. Bamberg said Scott's hands were by his side and he was slowly walking backward when he was shot. Residents say Scott was unarmed, holding only a book, and disabled by a brain injury. But it's unclear what the body cameras worn by three officers who were present during the shooting during the shooting may have captured. The plainclothes officer who shot Scott, Brently Vinson, was not wearing a camera. He has been placed on leave, standard procedure in such cases. Vinson is black. At Thursday's press conference, attorneys for the family indicated that Scott's wife was a witness to the fatal shooting of her husband. Attorneys reiterated the need to respect the family's grieving process. As officials have tried to quell the unrest unfolding on Charlotte's streets, at least three major businesses were asking their employees to stay home for the day as the city remained on edge. Mayor Jennifer Roberts told ABC's "Good Morning America" that officials were considering a curfew. But during a news conference later she said the city was "open for business as usual." In an interview with NPR, she said that the timing of the video's release depends on how the investigation progresses. When asked if officials shouldn't be more transparent, she said: "The transparency would be helpful if the footage is clear and if it covers all the different parts of what happened that evening. Since I haven't seen it, I'm not certain of that and that may be the case. There were a couple of different body cameras, there was a dash camera, but as you know sometimes those can be not clear." North Carolina has a law that takes effect Oct. 1 requiring a judge to approve releasing police video, and Putney said he doesn't release video when a criminal investigation is ongoing. The streets were mostly quiet during the day Thursday, but Bank of America, Wells Fargo and Duke Energy all told employees not to venture into North Carolina's largest city after Gov. Pat McCrory declared a state of emergency Wednesday night and called in the National Guard after the police chief said he needed the help. The North Carolina National Guard arrived at a Charlotte armory early Thursday, and Guard vehicles left the armory about 8 a.m.
Federal help also is on the way, with the Justice Department sending to Charlotte a team of trained peacekeepers designed to help resolve community conflict. The department's Community Relations Service has been deployed to other cities roiled by tense flare-ups between police and residents. A peaceful prayer vigil Wednesday night turned into an angry march and then a night of violence after a protester was shot and critically wounded as people charged police in riot gear trying to protect an upscale hotel in Charlotte's typically vibrant downtown. The victim of that shooting, 26-year-old Justin Carr, died Thursday, police confirmed. The shooter was not a police officer, city officials said, and law enforcement is opening an investigation. Putney said Thursday that police were investigating who fired the shot in response to an allegation that a police member was involved. He said he was trying to find out the truth. 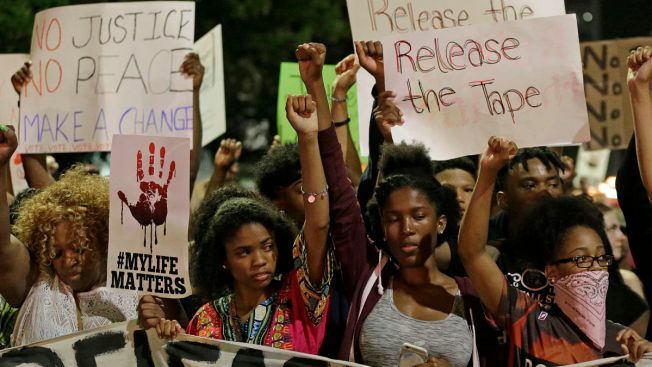 On Wednesday, hundreds of protesters who were shouting "black lives matter" and "hands up, don't shoot" left after police fired flash grenades and tear gas after the shooting. But several groups of a dozen or more protesters stayed behind, attacking people, including reporters, shattering windows to hotels, office buildings and restaurants and setting small fires. The NASCAR Hall of Fame was among the places damaged. Putney, the police chief, was angered by the stories on social media, especially a profanity-laced, hourlong video on Facebook, where a woman identifying herself as Scott's daughter screamed "My daddy is dead!" at officers at the shooting scene and repeating that he was only holding a book. Putney was adamant that Scott posed a threat, even if he didn't point his weapon at officers, and said a gun was found next to the dead man. He also said: "I can tell you we did not find a book." Attorney General Loretta Lynch drew attention to situation Thursday by calling for a "peaceful way forward." She said the shootings there and in Tulsa "underscore divisions that exist." Lynch called for an end to violence and also said that most of the demonstrators were exercising their rights to peaceful protest. "We need your voice," she said. "We need your passion. We need your commitment." She said those bringing violence should stop "because you're drowning out the voices of commitment and change and you're ushering in more tragedy and grief in our communities." 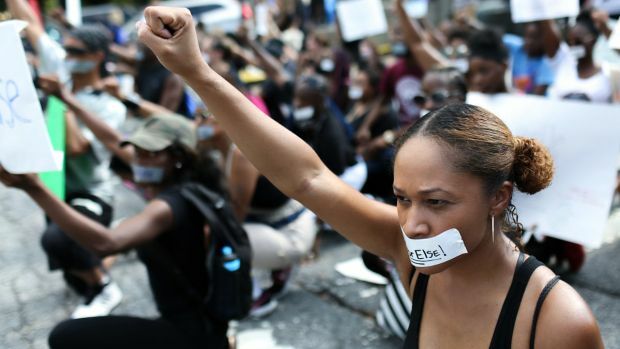 “The events that we saw are not the Charlotte that I know and love,” she said.